Mount Washington looms over coastal New England. At 6,288 feet, it is visible from the Atlantic Ocean, 80 miles away. The highest windspeed ever recorded was clocked here on April 12th, 1934 at 231 mph. The “home of the worst weather on Earth” is accessible by a winding toll-road, but (for once) I decide to leave the car behind and take the historic cog railway allowing me to sit back and enjoy the ride as it claws its way straight up the mountain. 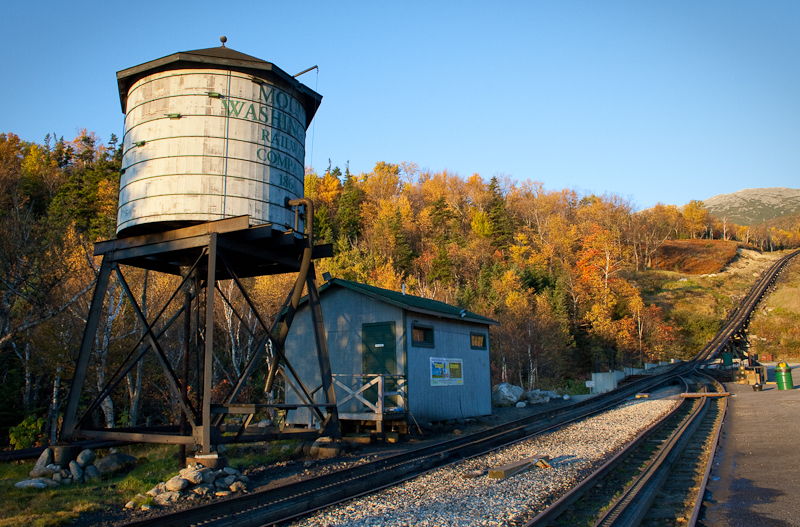 An old-style watertower stands over the tracks at the base of Mount Washingtons historic cog railway, keeping the locomotives cool on their slow grind to the top.